Last night a few of us from our Young Adult Bible Study group drove 2 and 1/2 hours to Los Angeles, to the Wiltern, to see Rob Bell's Drops Like Stars Tour. When we arrived we were astonished by the crowd. The line for admission stretched around the entire building and looped around in a serpentine pattern so, needless to say, the turn-out was a good one. I even got to see, though briefly, a few old friends including Rick Ellis (to whom I am not related). I felt somehow a little more sane seeing all those people there to see Rob. In my town I'm never quite sure what people think of Rob Bell but there is rarely a soul who knows anything about him who does not harbor skepticism or even negative feelings toward him. So being there with those people, although I realize that they were a mixed bunch as well, made me feel like I wasn't crazy. In fact, I should say, I always feel a bit more sane when I get out of town and go to LA. Rob's talk was nothing short of therapeutic. The discussion was on creativity and suffering and he didn't leave us with clean-cut answers but somehow I think we all left there with a sense of hope and a renewed openness to the future. I have a profound sense now that I can look toward the future with creativity. I can let go of, yet stay open to, the rigid structure of my future to which I held so tightly. I can look with creativity toward how I do church, how I treat others, how I respond to difficulty and frustration, and how I can rebuild out of brokenness. I can also see the endless possibilities that can come when my plans are disrupted and I can look with open arms toward the suffering of others. I can't say enough how appropriate his discussion was for my own personal Lenten reflections. I am, as some of you may know, going through Henri Nouwen's From Fear to Love (an almost ironically appropriate title) which consists of daily reflections for Lent on the Prodigal Son story. It's interesting that Rob Bell began his discussion with a glimpse at that very story and reminded us that it is a story without resolution, but it somehow resonates with people across history and society and societies. Perhaps, as Rob mentioned, this is because we've all been to a party where the older brother was missing. This story brings out all the tension of suffering yet simultaneously there is the overarching theme of forgiveness and openness and, still yet, the story is left unresolved. Like suffering, it leaves us hanging, it leaves us alone and yet together. We are left to look to the future, a whole new future because the one we knew before no longer exists. Lent teaches us to let go and drops like stars teach us to let go, and in all of this God invites us to open up and to possess everything. I think I know what I am giving up for lent--how about the future? I am going to give up on fear of the future and take up a renewed openness to a whole different future altogether. I guess this is what it means when people say, "God is working in my life." 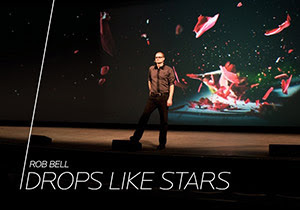 I tend to like Rob Bell. He is really incredibly intelligent yet he rarely gives "answers" - but more often than not stirs up new questions. I think this is why some people dislike him so much. And sure, I have heard some of his sermons that I don't care for (or don't agree with some of the theology) but honestly I don't bat 1.000 either in mine. And when I've seen him speak live (like at the pastors conference last year) he's been nothing short of phenomenal. Rob is just an artist and so I think he's often misunderstood as many artists are. He's one of those guys that I'm just searching for something to disagree with him on (just so I can feel like I'm thinking for myself) but every time he says something that I might disagree with I'm inclined to forgive him because it's never the heart of his message. I just can't help but be blessed by his words.